July is bark peeling season here in Southern New England. Tree bark is an important resource for anyone living close to the land as it supplies the raw materials for many things; coverings for dwellings and canoes, string and rope and containers of all kinds. Many species of trees bark share exceptional properties that make it so useful. Many become pliable when wet and ridged when dry. Many contain strong fibers and some oils that lend to flammability and rot resistance. One of my favorite things to make during this time are bark berry buckets. This July I peeled some bark for this purpose. 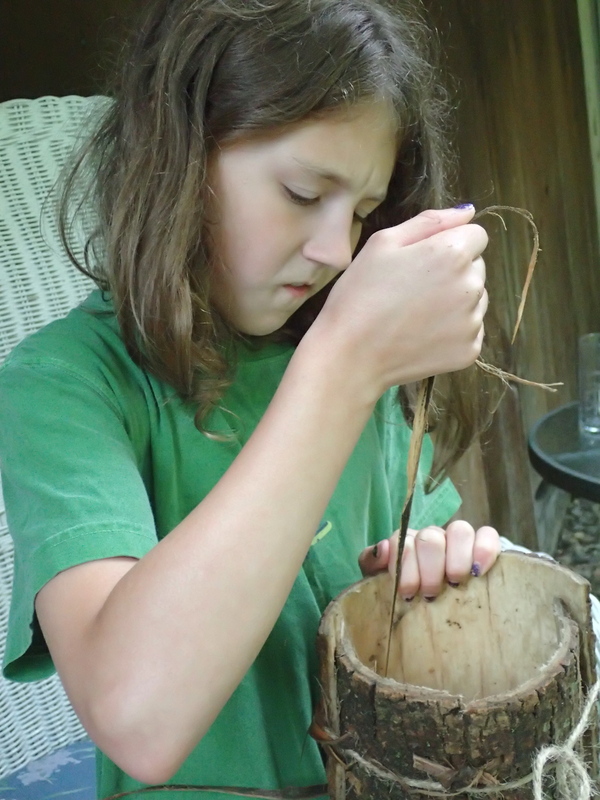 Here are some images of my daughter making a berry bucket. In the future I may do a full tutorial on how to do this. For now I will hit the high points. The bark (in this case of tulip poplar) is folded in half at the bottom in a certain way to create an elliptical cross section. Then the edges are stitched together. 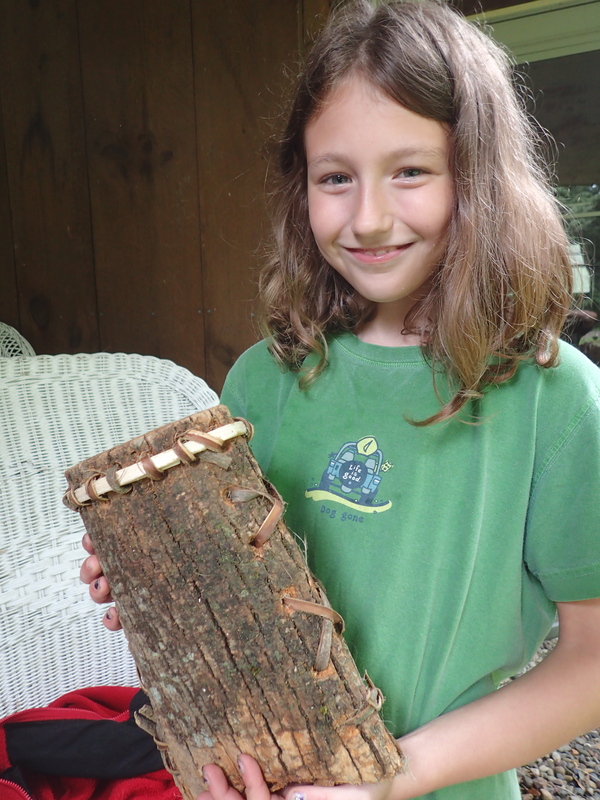 Gabby used a bone awl to make the holes and then stitched with hickory bark. I prefer hickory bark taken from saplings or branches (any species of hickory seems to work similarly), it is very strong and drys to a wood-like hardness). A rim is then stitched on, in this case Gabby wanted to leave one side of the bark proud above the rim for “style”. We had a fun time together working on this. My daughter went right out and picked blueberries with it, nearly filling it. 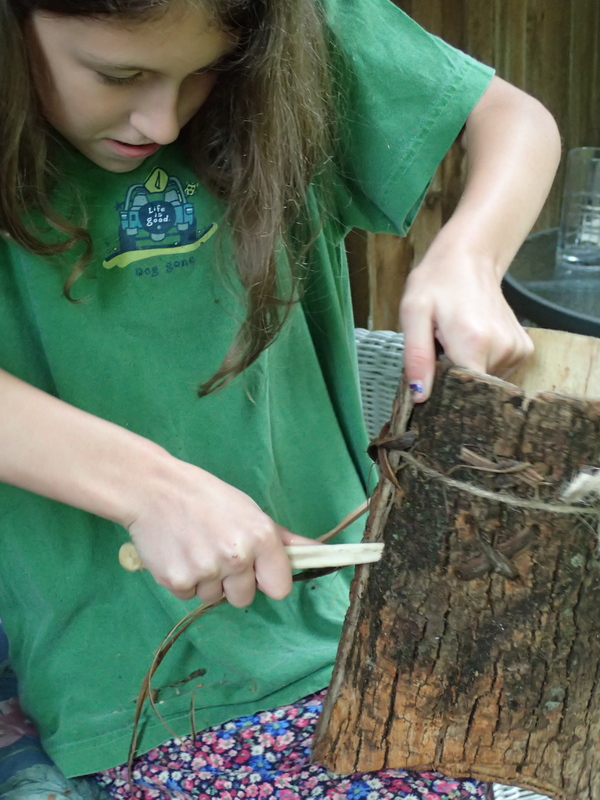 This and other bark projects are great for kids and beginners to woodcrafting or wilderness skills.